Madison Landing proposal includes 127 residences designed for active adults, age 55 and older, including condominium apartments, townhouses and a broad spectrum of single-family homes. The Meetinghouse, located on the Neighborhood Square, will include a variety of amenities for residents. A walking trail will meander along the perimeter of the neighborhood, affording many opportunities for the public to enjoy nature close at hand. The Neighborhood Square will be the focal point for all the community activities - including meetings, fitness, lectures, social activities and more. The neighborhood plan includes sidewalks, walking paths, parks and greens designed to encourage walking and casual encounters with others. The Entrance Green leading to Madison Landingis flanked by traditionally designed single family homes. The entry road terminates on a collection of buildings to the rear of the Green, which collectively form the Neighborhood Center, with plans calling for a Meetinghouse, health club, swimming pool, continuing education and business center, and other amenities. 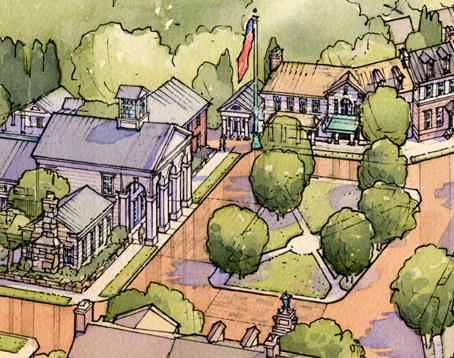 A Design Code, specifically written for Madison Landing, will ensure that the architectural quality and character of the neighborhood will be consistent with Madison's cherished older neighborhoods. Plans for the 42-acre property call for a substantial amount of open space to be accessible to the public, including walking paths near the beautiful salt marsh.